With product marketing now taking center stage, the role of the modern marketer is undergoing a tremendous change. The startup world is pretty scrappy, and a plain vanilla marketer is a thing of the past. Product Marketers are not only expected to adjust to fast-moving changes, but they also need to show a broader skill-set as needed. So whether it is knowing the chops of HTML, design, videos or SEO, there’s an underlying expectation that they know it all. Needless to say, without the ‘right tools’ this will be an uphill task. From prototyping to designing a full-fledged landing page, finding bugs to discovering the right keywords, understanding your user’s website behavior to managing each response, we’ve scouted the internet to find the perfect tools for a product marketer’s arsenal. These tools will not only help simplify the Product Marketer’s tasks but will also help them focus on the most important part of their job: making their product visible to the world! Every task that you take up as a team requires you to coordinate with each other, often around the clock. We’ve all been part of mismanaged flows and directionless planning, and that’s why, even before we dive deep into more crucial tools, it’s best to look at a few project and time management tools. These tools will help the whole team take faster and more concrete decisions as well as be up=to-date on every action in real-time. Trello – Trello is one of the simplest “whiteboard” tools out there. It helps teams collaborate and build lists around a project as well as organize and prioritize the most significant elements. Asana – Another popular tool, Asana allows users effectively track and manage their projects and saves teams a ton of time lost shuffling between various spreadsheets, documents, and conversations. It helps streamline communications and keeps things on track – key aspects of product building. Time Doctor – allows users to see how much time is spent either working, in meetings, breaks. Time Doctor helps to accurately track time spent on projects and offers detailed reporting, webpage and application monitoring, and more which are crucial to optimizing product development timelines. Every Product Marketer realizes the significance of a product roadmap tool. It helps them flesh out tentative features and ideas that they want to see in the final product. The biggest benefits of these tools are in helping PM’s strengthen their vision, and building product related strategies in a more efficient manner. Roadmap tools can also be used to validate what their users really need by consolidating user research, feedback, and requests. Given that product roadmap planning involves multiple team members, a sound product roadmap tool can help consolidate it all in one place, eliminating the need for exchanging multiple spreadsheets, presentations, and applications. Product Plan – Product Plan offers a drag and drop interface that helps build visual roadmaps with ease. The product offers time-saving features such as a planning board and a parking lot feature that allows you to save future opportunities under a single window. Product Board – Product Board helps PM’s dig deep into user insights and even lets them prioritize a score set against features. ProdPad – ProdPad helps busy Product Marketers build faster product strategies. The app offers tons of well-thought-out features that simplify their tasks. Lack of research – taking a hasty decision and building a product based on “gut-feel” – can lead to unsuccessful product launches and ill-conceived features. Solid research involves reaching out to prospects and gathering as much scientific data as possible. Survata – Survata is a brand intelligence platform that helps businesses dive deep into the minds of their customers and helps them attain better insights into the demographics, attitude, and behaviors of the end user. Survata can also help PM’s gauge a user’s interest before going to market. Typeform – Typeform is fast becoming the go-to tool for conducting user research. 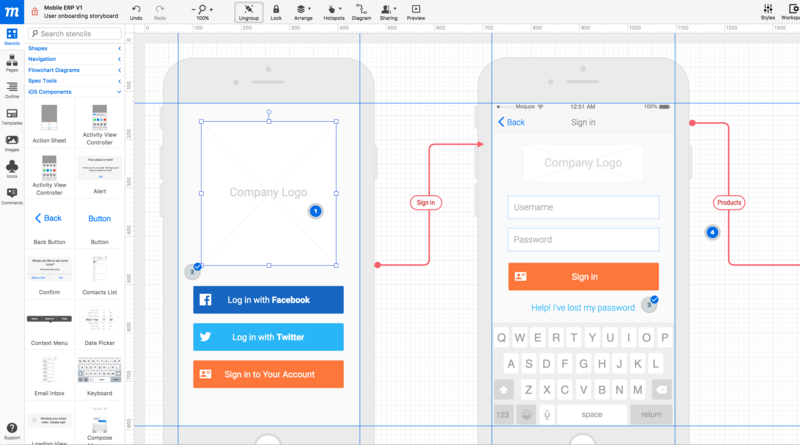 The app comes loaded with easily customizable templates. It’s UX is one of the reasons for its rapid adoption. It’s a great form builder with lots of features for gathering feedback. User Testing – If you are looking for deep and authentic insights, User Testing should be your go-to tool. This tool is perfect for discovery interviews, testing prototypes, and marketing concepts. Here are a few tools that can come in handy while creating mockups and wireframes, and finding the right icons and stock images to create a functional blueprint. 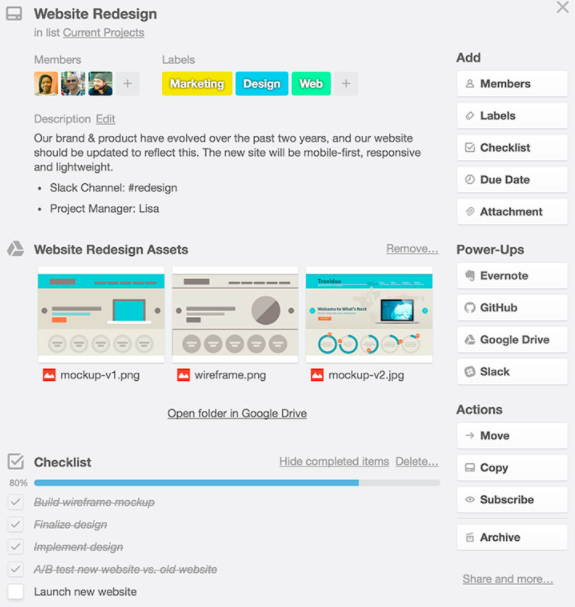 Moqups – Moqups helps you design, plan, prototype and collaborate with a single tool. It also offers ready to use stencils, icon sets and an extensive range of fonts and styling options. Invision – Invision is an industry favorite when it comes to prototyping and building wireframes due to the advanced features and functionality that it offers to teams. The Invision team has recently revamped its own product, adding some interesting features which launch in 2018. Having created a prototype, which is a proof of your concept, you need to gather feedback and improve functionality. Once you’ve done this, is time to bring your product to life. That’s where you require tools that help you transform your static ideas to more interactive ones. Here’s a list of tools that will help you achieve your vision. Unbounce – Unbounce lets busy marketers create customized landing pages. The tool comes loaded with responsive designs for both web and mobile. It offers various integrations with multiple emails, CRM, and automation tools, and even lets companies retain their branding. The company also offers a free landing page analyzer that tests the effectiveness of the landing page and shares the results in a free report!. Instapage – Instapage helps you design beautiful landing pages that convert. The tool provides many ‘conversion-tested’ templates, along with an inbuilt collaboration tool that allows team members to share instant feedback. Apart from the above-mentioned landing page creation tools, there are umpteen other examples worth checking. Autopilot did a great comparison, which can also come in handy while making a decision. Setting up a landing page is just the first job; you also require stock images, fonts, and icons to bring your page to life. While a lot of landing page designing tools offer pre-loaded templates as a part of suite, it is always good to have dedicated tools that can give you a wide variety of options. Flaticon – Offers a large database of free icons for various categories. Unsplash – Offers a large repository of high-resolution and free photographs from artists across the globe. Backed up by the team at Crew. Apart from offering information about a product, the ultimate purpose of setting up a landing page is to capture a visitor’s interest. That’s where lead generation tools come in handy. These tool help to highlight the core product offering, as well as facilitate conversation with visitors. Hello Bar – Hello Bar helps convert your visitors into customers and is a great alternative to using pop-ups on your newly created landing page. It offers an obstruction-free way to highlight your product’s central message. If a visitor on your landing page needs help to take an action, you need to be able to offer it to them, quickly. Efficient, easy-to-use help allows visitors to instantly connect with your product, making them more likely to buy. Live chat tools or customer communication tools are some of the best ways to show the visitor that you are available to help them. 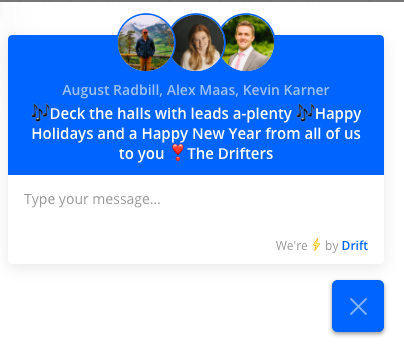 There are numerous tools out there, but the folks at Drift and Intercom offer a comprehensive communication and conversational marketing platform for marketers to engage with their audience. Apart from the regular Google Analytics script that runs on your website, there are numerous other tools that help you track visitors behavior on your website. These tools not only help identify where your visitors are coming from, but also what they are doing on your website and how you can optimize your efforts. Here are a few of the tools that can help identify user behavior. 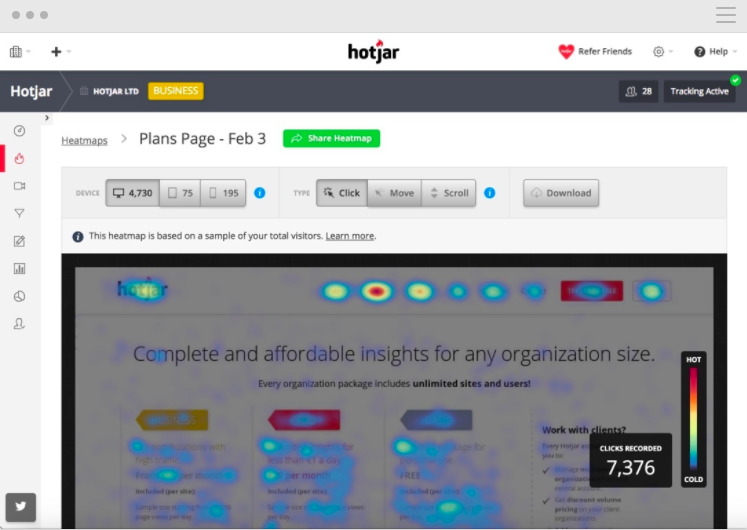 Hotjar – Hotjar is an ‘all-in-one analytics and feedback gathering tool’ which offers heatmaps, recordings, and form analysis and also lets marketers run surveys, polls and even recruit user testers. Mixpanel – Mixpanel offers in-depth insights into a user’s journey both on the web and on mobile, which helps improve acquisition and activation flow. Qualaroo – Qualaroo is essentially a customer decision analysis tool that helps companies analyze real-time customer feedback from within the app. With this information at hand, PM’s can get valuable insights about their product and improve the entire customer journey. Having set up a well-defined product, it’s time to gather and reach as many users as possible in order to get more conversational with them. These conversations turn into leads at a later stage. MailChimp – One of the most popular email marketing software product out there, MailChimp offers a bevy of features. The platform is hands-on and offers rich segmentation, multi-variate testing options, and preloaded email templates. GetResponse -Though primarily an email marketing solution, GetResponse offers its users a platform to create landing pages and launch webinars as well as the ability to use it for marketing automation. The email marketing tool offers drag and drop email editors, analytics, A/B testing and segmentation options. Customer.io – Customer.io is a powerful tool that lets marketers send relevant messages to the user based on what they are doing inside the product. It offers automation, segmentation, personalization and deep analytics to make sense of your campaigns. Voila Norbert – The ultimate email finder tool. Whether your looking to build marketing connections or collaborate with influencers using Norbert is a must. It’s also worth checking out their email verify tool. HubSpot CRM – Hubspot’s comprehensive CRM allows users to log emails, record calls, and manage their sales data effectively. It also offers a built-in management tool to keep track of warm leads. Close.io – Close.io is an inside sales CRM tool that helps consolidate calls, emails, and reminders in the same place. It has unique features such as in-built calling, which reduces moving in and out of the CRM, thus increasing the team’s efficiency. There can never be an exhaustive list of tools when it comes to product marketing. There’s constant evolution in the space and new products are hitting the market each day. Ensure whatever tool you choose it adds to your sales pipeline. However, the above-mentioned list is replete with the right tools to get started and achieve success with your product. Which tools helped you in your product marketing journey? Share with us in the comments below! Hi, one of the main issues for some product marketers is that they are never close enough to the product team and there is a lack of communication which can undermine the marketing of the product. With a collaboration tool such as https://www.fluidui.com/ the entire team will be on the same page thanks to the live video chat which operates within the tool.